availability. We are an actual proshop and don't have a shopping cart. We sell and ship anywhere in Australia & New Zealand. Don't judge a book by its cover. Beefed up with a Carbon Fiber Infused coverstock for the very first time, this Black Widow is ready to strike. Aggression Pearl CFI is the most responsive coverstock Hammer currently offers. Combined with a 500/1000 polished finish, you can expect good length through the front of the lane with an incredibly aggressive backend motion from this Black Widow. The Gas Mask core is the most iconic weight block in bowling. It is known for its large flare potential, versatility amongst bowling styles and its backend bite. The Venom line is getting a power upgrade with the new Venom Recoil. This is the first asymmetric Venom ever released by MOTIV and it features the new Gear APG (Asymmetric Performance Gain) weight block. Because the balance-hole rule has changed, MOTIV created the asymmetric Gear APG weight block to give ball drillers more layout versatility when no balance-hole is used. The Savage core is a low RG, high diff core with a high mass bias. 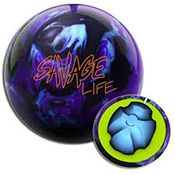 If you're looking for a new pearl ball with a ton of engine, the Savage Life is for you. Exciter Solid was extremely successful on the Savage and made a lot of our touring professionals' arsenals. The new Savage Life, with its Exciter Pearl cover finished at 500/1000 Abralon and Factory Finish Polish, will be the perfect step down from its predecessor and gives you a Savage 1-2 punch. That's right Track fans. Remember that amazing, predictable benchmark motion the Triton Elite gave you? Well, it's back, but with an updated coverstock and a slightly modified core. MC2 stands for "Modified Core 2". We took the shape of the original Core 2 Technology, found in the Triton Elite nearly 20 years ago, and made modifications which raised the RG and lowered the differential slightly. This core modification, in combination with the new coverstock, mirrors the Triton Elite motion that everyone loved. We recently placed our NRG Hybrid formula on another Storm ball – the PhysiX™ - and the feedback has been phenomenal. Seeing how this coverstock would perform on a low RG symmetrical core piqued our curiosity, and we’re glad it did. The Super Son!Q bridges the gap between the Master™ line and the Premier™ line seamlessly. Expect this ball to be the perfect transition between the PhysiX and the Son!Q™. Our ECA-XR Pearl coverstock combined with the Quantum Mushroom High RG Asymmetric core gives strong hooking motion with excellent pin carry on medium lane conditions. The Quantum series has been designed with 3.5 times more coverstock for improved durability, performance, longevity, and incredible hitting power. The enhanced Coefficient of Restitution results in the pins flying faster for greater pin action and more strikes. The Conspiracy Pearl uses the Conspiracy core and wraps it with the Forged 2 Pearl cover giving the Conspiracy Pearl more length and more angle down lane while maintaining the continuation that made the Conspiracy so successful. The Ludicrous Solid features the same flip core used in the Ludicrous but the motion is enhanced with the strong Ai-43 cover stock formulation. Our goal was to create a strong down lane motion the Ludicrous is known for, but add more hook. This ball was designed to be the perfect complement to the original HALO. Sure, both balls feature the same core. However, the big difference is the coverstocks. Wrapping this core with the eTrax Pearl cover creates motion in a completely different part of the lane. If you were to drill a HALO Pearl and a HALO the exact same, you would see approximately 6-8 feet more skid, which transcends into A LOT MORE BACKEND! The new Golden Jackal™ brings the legend of a pearl Jackal™ to life. Providing more length through the oil, the Golden Jackal™ displays an impressive backend motion. Never before has there been a Jackal™ with this kind of agility and speed!. The Golden Jackal™ features the latest Predator™ V3 asymmetric weight block to provide massive track flare potential and hooking power. This technology also produces a very low RG so the Golden Jackal™ is easier to rev, making it more forgiving on heavy oil patterns than higher RG balls that may slip past the proper transition point. Because sometimes, winning just isn't enough! Aggression Solid CFI creates more traction than any coverstock Hammer currently offers. Combined with a 500/2000 sanded finish, you can expect extreme traction in heavy oil and great continuation downlane and through the pins. The Statement core is a very low RG, high differential, strong asymmetric core designed to rev up in the heaviest of oils. Its intricate design has the majority of the mass located at the bottom of the core which will help this core retain as much energy as possible. Because sometimes, winning just isn't enough! Aggression Pearl CFI is the most responsive coverstock Hammer currently offers. Combined with a 500/1000 polished finish, you can expect good length through the front of the lane with an incredibly aggressive backend motion from the Statement Pearl. The Statement core is a very low RG, high differential, strong asymmetric core designed to rev up in the heaviest of oils. Its intricate design has the majority of the mass located at the bottom of the core which will help this core retain as much energy as possible. At Columbia 300, we like to live on the wild side. Bright colors on balls that hook off the lane and cause devastation to the pins. And this one is no different. Create some Chaos on medium to heavy oil conditions with an aggressive mid lane and continuous backend reaction. The Chaos core is a very low RG symmetric core with very high differential. You can expect the Chaos core to rev up very quickly in the mid lane. Exciter is the same coverstock we put in our High Performance Savage line. You can expect aggressive mid lane traction from the Exciter Hybrid finished at 500/2000 Abralon, along with a big continuous down lane motion. Flawless from core to cover, this baby shines bright like a diamond. Hammer's newest release will be sure to turn heads! Juiced Pearl is an extremely responsive coverstock first used on the Rebel Yell. Combined with a 500/1000 polished finish, you can expect good length with a strong backend motion from the Flawless. The 40 Watt core was named after its light bulb shape and differential in the forties. You can expect medium flare potential from this core. Mod-1 and GSV-1 Pearl have teamed up to bring you the Choice Pearl. Its great color pales in comparison only to its incredible performance. With easy length through the front of the lane on medium to heavy oil conditions, Choice Pearl will see friction and flip hard downlane with explosive pin action. Bonus offer - each customer who purchases the Ebonite Choice Pearl ball will receive 1 year subscription of Bowlers Journal (online subscription). Instructions are a sticker attached to the box, they will need to go onto the link HERE and click on INTERNATIONAL then will lead them to a page where they can enter the serial number of the ball. At Track, it's all about precision. Our engineers meticulously design every ball from the inside out. Track's new Precision Solid is designed to give incredible traction in the mid lane and motion down lane in the heaviest of oils. Track's new Prime coverstock advances the technology started in the original Paradox with the QR series.This new technology creates a more consistent and uniform grip on the lane compared to its predecessor. The all new Forge™ is the strongest symmetrical ball ever created by MOTIV®. Born from the fires of the Revolt™, the Forge™ is built for a smooth motion on medium-heavy oil conditions. Creating impressive control and outstanding continuation, casual bowlers will love the massive hook potential and competitive bowlers will appreciate the control. The brand new Detonator™ weight block provides a low RG and high differential to create easy revs and massive amounts of flare. Reverb™ outer core material surrounds the new Detonator™ core to provide explosive hitting power. The Kingpin Rule combines the Kingpin Ultra Low RG w/DynamiCore and our popular ECA-XR solid reactive coverstock. With this combo the Kingpin Rule is the perfect weapon for heavy oil, producing more hook and backend combined with amazing pin carry. The new Kingpin Rule will have you ruling not only over the pins but your competition as well! The Cutting Edge Pearl takes our popular Cutting Edge Low RG Symmetric Core and wraps it around our new 3C Pearl Reactive Cover. The Cutting Edge Pearl will provide easy length and a sharp break point making it a great choice for when the oil pattern breaks down or bowlers with slower speeds. The Squatch brings an old success back with a new look. We have taken the Yeti core and wrapped it in our new Ai-39 cover making this symmetrical core even more dynamic. As you remember the Yeti line was a big hit for the Radical brand and the Squatch will surely continue with that success. The Squatch is one of the most attractive balls we have every made, this color, core and cover combo is a sure winner. The Space Time Continuum™ features an ALL NEW Coverstock concept combined with a tweak of the core found in the Continuum™. The S71™ Re-Loaded Coverstock uses the base formula found on the popular Honey Badger™ It features enhanced polymerization of the molecular structure. This will significantly increase the overall backend motion of the ball. The Sphericon™ LD Asymmetric Core features the same shape as the Ellipticon™ core found in the Continuum. The density has been altered to yield a higher RG and lower differential. This will cause the ball to conserve more energy for the backend part of the lane. Use the Space Time Continuum™ on medium to medium-heavy oiled lane conditions. The ALL NEW Eon™ Infinite features a brand new coverstock concept combined with the same great core found in the original Eon™. The S71™ Re-Loaded coverstock utilizes the same base formulation as the popular Badger™. However, the molecular structure of the resin has been enhanced and optimized to increase backend motion on heavier oil patterns. The Oloid™ Symmetric Core features two congruent circles merged in perpendicular planes. This design causes a meandering effect on the center of gravity thus giving the ball more length. This added length allows the core to maintain it’s energy longer resulting in greater down lane hook potential. Use the Eon™ Infinite on heavy to medium-heavy lane conditions. The ALL NEW White Hot Badger™ is the symmetric compliment to the follow up to the popular Badger™. The White Hot Badger offers the most skid/flip reaction within the 900 Global symmetric line. The Lacerate­­™ core will provide easy length through the heads combined with maximum torque at the breakpoint. Expect to see a quick change of direction. This core also features a true two-piece design. Pure cover meets ferocious core!! Use the Badger™ on medium lane conditions where a quick change of direction downlane is desired.